With EPC Group’s 15+ years of enterprise content management (ECM) and records management (RM) experience, we have been involved in a large number of enterprise initiatives where organizations are utilizing multiple enterprise solutions within their environment to meet underlying business requirements. EPC Group provides for deep integration experience with OpenText Information Management platform(s) to meet specific scenarios and business cases for our clients. We have 10+ years of experience working with organization’s who want to continue to utilize both SharePoint and OpenText solutions for separate business functions where EPC Group is engaged to provide for seamless integration, records retention enforcement and workflow development to allow for the end user experience your organization desires. 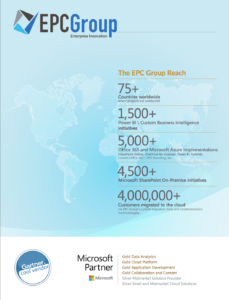 EPC Group also has a great deal of expertise in search integration between SharePoint and OpenText solutions as well as migrating organizations completely away from OpenText and into a true Microsoft SharePoint Server 2013 ECM or RM platform while maintaining the existing records retention schedule and compliance required. EPC Group also has experience in very similar scenarios with Documentum, FileNet, eRoom and other legacy platforms.